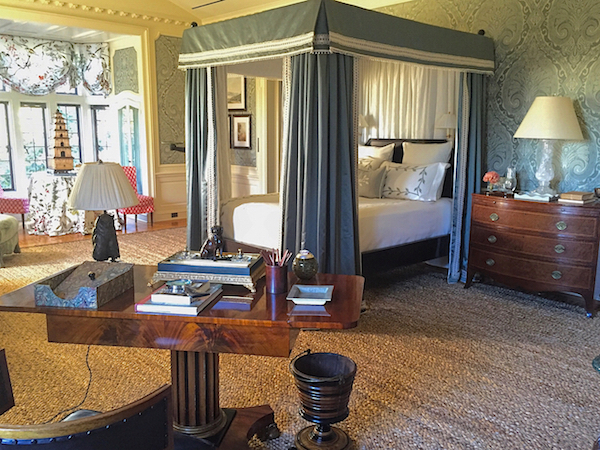 At the Greystone Mansion Maison de Luxe showhouse, Nina Campbell designed a luxurious bedroom suite suitable for a modern day Mr. Doheny, patriarch of the legendary estate. Stately and sophisticated yet appropriate for modern day living, it is a stylish statement of elegance and aplomb. 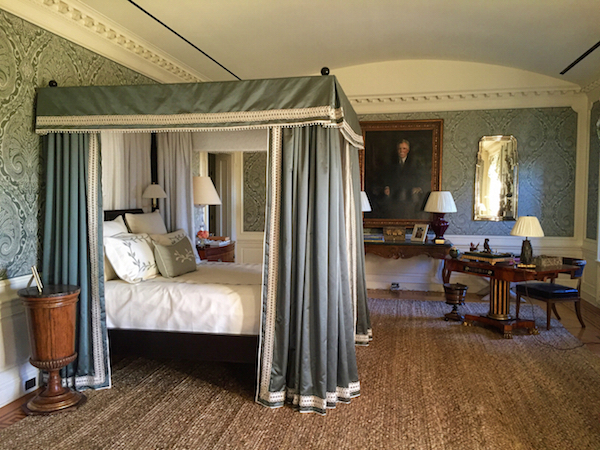 “We set out to create a comfortable, classic but contemporary bedroom for a modern day Mr. Doheny.” Adding a touch of authenticity, a 1925 portrait of Edward Doheny, which originally hung in the living room, was lent by his great granddaughter for the room. “In a fabled house with many a haunted tale, he seems quite happy to be back in the house and approving of our room. We certainly haven’t had any problems or odd moments to indicate otherwise.” Those of you who have not had the pleasure of meeting Nina, may not realize that behind the esteemed talent and elegant designs, lies a wicked wit and sly sense of humor. Nina designed the spacious room as part of a suite, a place of respite where Mr. Doheny could sleep as well as work and study. A great mix of antiques and accessories give the room a sense of life and personality. 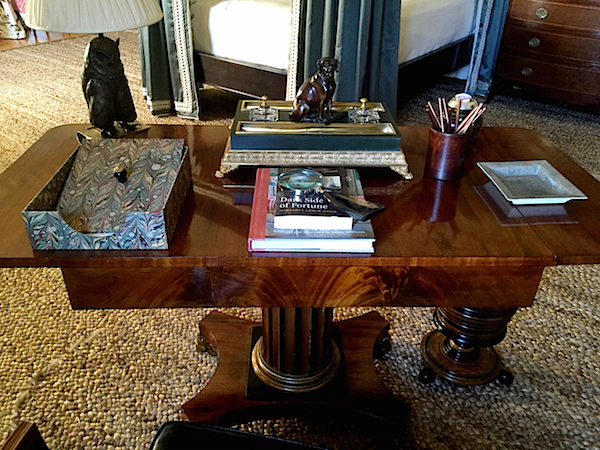 On the handsome desk from John Nelson Antiques, sits a beautiful marbleized letter box, from a collection of exquisite bench made products by friend Beth Scanlon of Scanlon Apparati, whose work can be found locally in Los Angeles at Hollyhock. Her “personal and romantic interpretations” of historical decorations are particularly appropriate for Nina’s storied space. 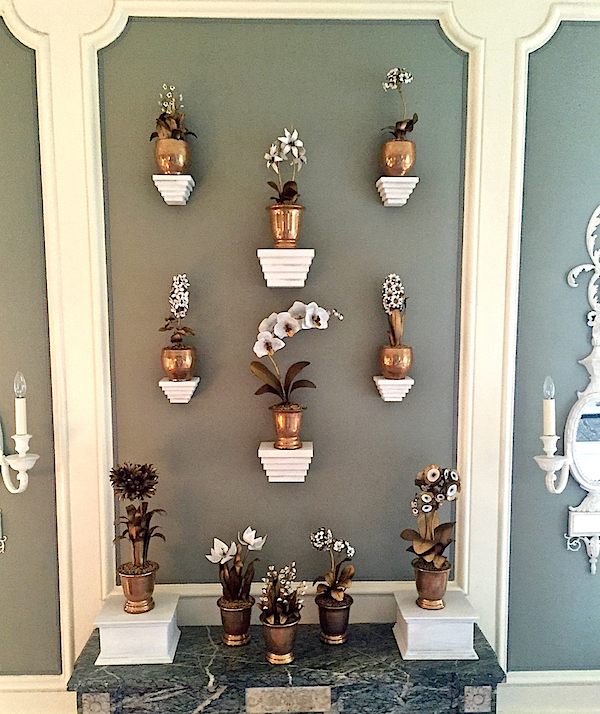 One of the most unexpected yet winning moments in the room is the wall above the fireplace, where Nina topped modern shaped wall brackets with a collection of lusterware and porcelain pots from Tommy Mitchell. This wonderful decorative scene is a fresh twist on tradition, adding surprising visual interest in the space. Within a serene palette of grays and soft sage, pops of floral and color keep the room lively and bright. Upholstered walls of Nina’s Khitan overscaled damask for Osborne and Little envelop the room with subtle pattern and soothing color. 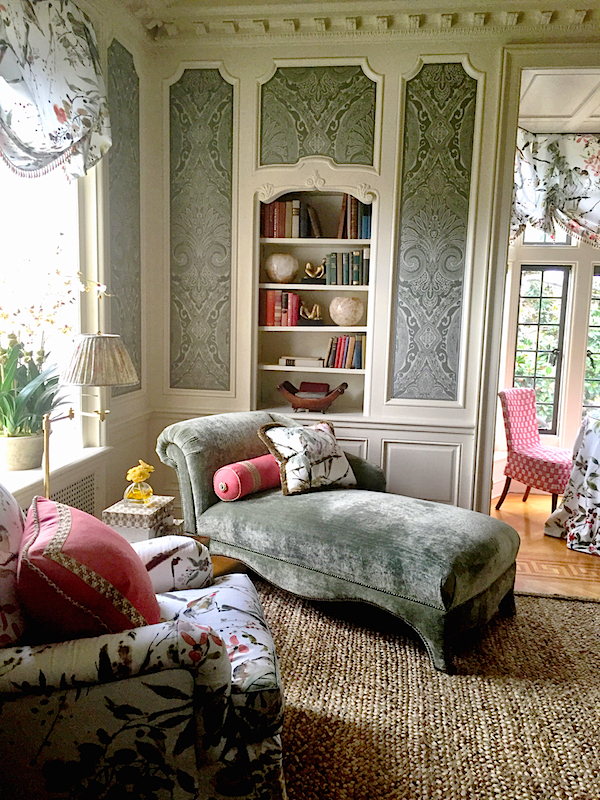 The chaise, from O. Henry House, is so inviting, swathed in Nina’s lush Cantabria velvet. Curtains and armchair enliven the classics with Penglai, a nature inspired painterly pattern. 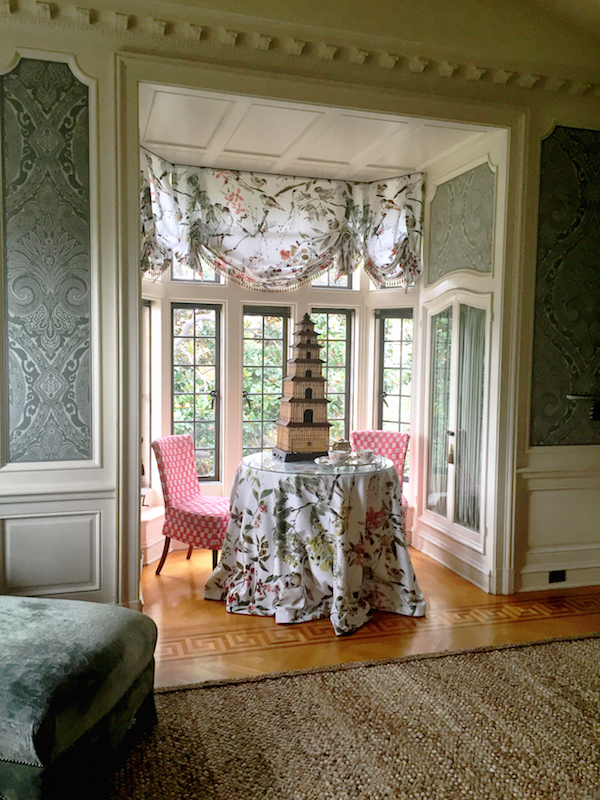 In the charming bay alcove, a seating area is ready for afternoon tea, accentuated by a marvelous bamboo pagoda from Kristen Buckingham. Anchoring the room is a handsome four poster bed from John Rosselli, dressed with fabrics from Pierre Frey (inner) and Chase Erwin (outer) with trim from Samuel and Sons. Lovely appliqué linens from Leontine Linens cover the luxury mattress and boxspring from Vispring, ensuring both a beautiful and comfortable time in bed! 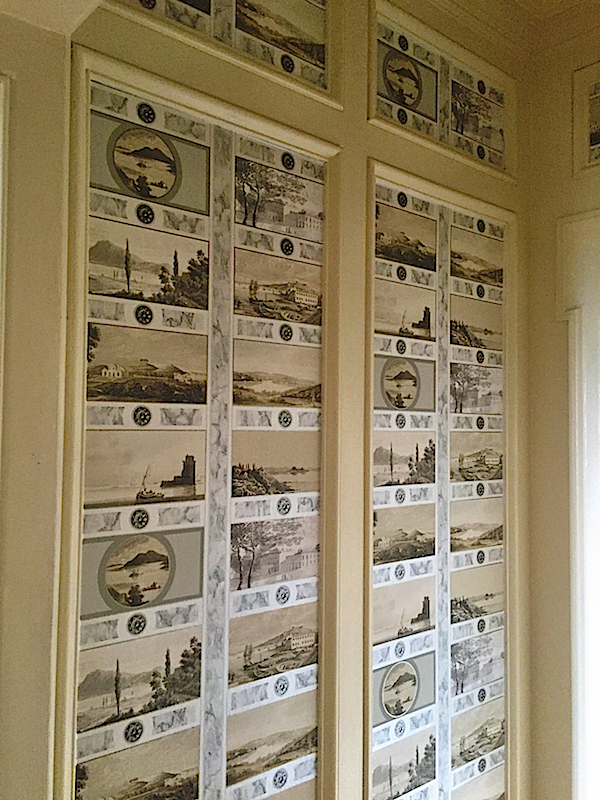 While the room is rife with references to the past, the most personal is the enchanting wallpaper in the entry. Featuring a selection of miniature multicolored landscape paintings, Nina’s new Keightley’s Folio Wallpaper sets the series within a stone colored marbleized border, highlighted with small rosettes. Based on watercolor prints Nina discovered from her great-great uncle, Lieutenant Robert Hely-Hutchinson Keightley, from when he was posted in Malta and Corfu, they bring a true sense of personal history to the space. 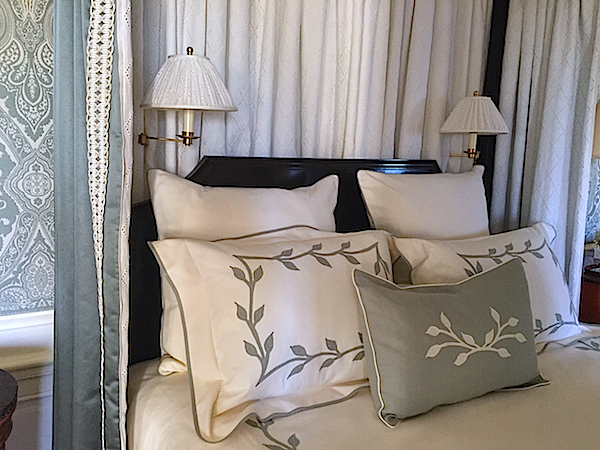 Stop back next time to see the rest of Nina’s swank suite at the Greystone Mansion Maison de Luxe showhouse. This entry posted in art, design, furniture, interior design. Entry Tags: designer showhouse, Greystone Mansion, Maison de Luxe, Nina Campbell Bookmark the permalink. Wonderful. Thank you for posting this beautiful retreat. Many beautiful touches and an overall balance that is not overwhelming in its coordination. May I ask about the rug?? Is it wool and jute/hemp?? Or does it just give that appearance. A terrific unifier for this post colonial aesthetic. Beyond amazing!! Such a beautiful space, just love the muted, tranquil and sophisticated color scheme along with Nina’s the elegant style. Can you tell us anything about that lovely floor covering? Yes Stefanie – the rug is from Stark. Well, another amazing home! So much gorgeousness. Stunning. Thank You. Nina’s room turned out beautifully and we’re thrilled she decided to use our orchids in the window. It’s hard to believe that after all the work that went into Greystone, they’re dismantling the rooms next week. We think it should be open longer! Your orchids were just beautiful!! The bright light streaming through the windows unfortunately washed them out in the photos. Absolutely beautiful. Thank you for sharing every lovely detail of Nina’s room! 83 queries in 0.597 seconds.